England's Lee Slattery won his second European Tour title with a narrow one-shot victory at the Russian Open. 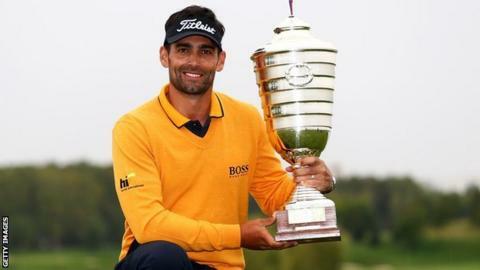 The Cheshire player began the fog-delayed final round two shots ahead of Argentina's Estanislao Goya and Scotland's Craig Lee. But although Goya was two ahead by the 12th, he bogeyed the 13th and 15th and Slattery chipped in at the 17th for a two-under-par 69, finishing 15 under. "To chip one in at such an important time meant so much," said Slattery. "It's just nice to be able to finish the year off like this with a win. My wife's dad is very ill as well, so this is for him." Lee posted a 71 to finish joint eighth, while England's David Horsey was third on 13 under, a shot behind runner-up Goya.